Banbridge regained their spot at the top of Division 2A on Saturday with a bonus point win over strugglers Thomond. Bann secured a 54-0 success at Rifle Park, enough to edge ahead of Naas, who won four points with a 20-15 success at UCC. It seems that the race for the title and automatic promotion will go down to the final day but Bann now have the edge, a point ahead of their challengers andwith a better points differential that could ultimately prove decisive. Bann coach Daniel Soper said after Saturday’s game that he couldn’t have asked for much more from his players. “We had two objectives for the day,” he said. “One was to pick up the winning bonus point and the other to get a really positive points differential. We had the bonus point by half-time but with Thomond seeming to lose interest it might have been difficult to keep our structure. Injuries and unavailabilities had forced Thomond to travel north with only three replacements on the bench and they struggled from the outset to contain a Bann side obviously determined to maximise their points tally. No 8 Stephen Irvine touched down after just three minutes only to be called back by the referee who decided that Bann should have a penalty, on which they failed to capitalise. But six minutes later, Andrew Morrison made a scorching break on the Thomond 10 metre line. The Bann centre was hauled down short but managed to stretch out to effect the touchdown, with Adam Doherty adding the conversion. Thomond managed to spend some time in and around the Bann 22 but that was largely thanks to the home side’s propensity to concede penalties. But the visitors never seriously threatened to get off the mark and three further tries in the second quarter of the game underlined the home side’s superiority in most aspects of play. Irvine crashed over the try line from the back of a ruck for an unconverted try before Josh Cromie and Adam Ervine combined down the left flank only for the latter to be hauled down a metre short. 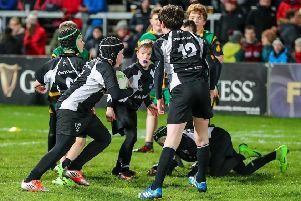 But the pressure was still on Thomond and after Shandon Scott had charged down an attempted clearance kick, Johnny Little retrieved the ball to fall over the try line, with Doherty converting. A series of injuries, which mainly affected the visitors, resulted in the scrums going uncontested. In the sixth minute of injury time, Doherty made the initial incursion through the defensive line before setting Peter Cromie off a on a sprint to the line from the 22, with Doherty’s third conversion taking his side 26 points clear at the break. Fraser Mulholland and Irvine were yellow-carded in the 51st minute for a dangerous clear-out at a ruck and soon afterwards Thomond’s Croation prop Alexander Slijepcevic also took a ten minute break after being carded for his actions in the loose. But despite their one man deficit, Bann forged further ahead when Morrison’s break put Doherty in for a fifth try. Peter Cromie tapped a penalty on halfway and scorched through the fractured Thomond defence to set up Little for his second try. It was all one-way traffic and Irvine made good ground for Doherty to race in from 15 metres range. The Bann ranks were again numerically reduced when Chris Allen was red-carded for an injudicious remark aimed at the Thomond prop but the scoring continued with Morrison winning the race to his own hack into the in-goal area for his side’s eighth try. Doherty converted all four second half tries which, with his two touchdowns, saw him contribute 24 points to his team’s tally. Head Coach Soper was able to make full use of his bench, with prop Ross Haughey getting his first taste of AIL action. Bann now have to wait until Easter Saturday (26th March) to travel to Galway Corinthians with that last fixture at home to Malone the following Saturday.